Cornerstone has a pictorial directory for the congregation. It contains photos and contact information for church members, staff and active friends of the church. The directory is available online, but password protected and encrypted, and only available to members of our church family. Online access to the directory is available via computers, tablets, and smart phones (apps are available for Apple, Android, Kindle, and Windows phones). To request access to the directory click on the entry form button above. One form must be submitted to provide information for the primary contact and the family. 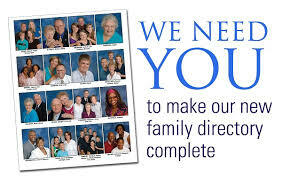 Additional forms can be submitted if other members of the family would like to have their own personal contact info and photo available on the directory. Once the accounts have been set up by the directory administrator instructions will be emailed on how to update contact information and photos anytime you wish). A church directory is only useful if YOU participate.